Concern over depression figures: I read an article on the Irish times.com page today and it took me by surprise. It was about the results of a recent survey from people here in Ireland and it shows that the stigma attached to depression still exists in this backward country and a high percentage of people still have an old-fashioned view when they hear the word depression or if they hear of someone close to them that suffers from it, they seem to run for the hills. I read that two out of five of us would not want to know if a loved one was experiencing depression even though almost everyone acknowledges talking about the problem is an important part of recovery. The 2011 Mental Health Barometer commissioned by the pharmaceutical firm Lundbeck also found that almost a quarter of people still think depression is a “state of mind” rather than an illness. Some 49 per cent of people said they would want to know if someone close to them was suffering from depression while 42 per cent said they wouldn’t want to know. Just 37 per cent of young people under 25 said they would want to know, said the survey, which has been conducted every year for the past six years. The Lundbeck mental health barometer shows almost a quarter of Irish people believe depression is not an illness but a state of mind. “There is clearly a sense of embarrassment or concern that discussing it would be too personal or backward… it appears that depression is somewhat objectified and feared,” said the survey. Three out of five people said they considered stigma to be an issue for people suffering depression. And even though the perceived stigma of suffering from depression has reduced over recent years, it is still significantly higher than the stigma associated with a range of other conditions including: Alzheimer’s, Parkinson’s, cancer and heart disease. “Sometimes people just need to talk. It can be the first step towards recovery. By providing a sympathetic ear and encouraging them to get professional help they could make a real difference in their friends life,” he said. The survey also found groups perceived as being the most at risk of depression- typically young, unemployed- men were not the biggest sufferers of the illness. 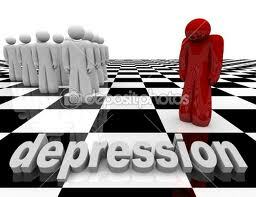 In fact, 69 per cent of those suffering from depression in the survey were women while just 31 per cent were men. The occurrence of depression is perceived as being less common in the elderly, despite the reality that depression is common in old age, said the survey. Overall the survey found depression remains a widespread condition in Ireland, experienced by 4 per cent of the population directly at some stage, with almost one in eight knowing someone close to them who has experienced it. In my opinion I feel that even though people are much more aware of depression now than years ago, they still tend to shy away from the subject and the person that is suffering can find it hard to approach family members or friends. I was worried about telling my family as I did not know how they would react but looking back it was the best thing I could have done as they have been so understanding and such a good help, as have Linda, her family, my friends and most recently my team mates at Blackhall Gaels. So I urge people out there that still have the opinion that a person with depression should ‘just snap out of it’, to learn some more on the subject, talk to the person and aid them in their quest to get better. Depression is everywhere in Ireland at the moment so we are all going to come into contact with it in some shape, way or form in the future, so please lets change are stone age attitude, drop the macho image and talk and help.